I might have to make a toasted sandwich today. I am calling it National Toast Day! Heck, they have a pancake day so, why not. 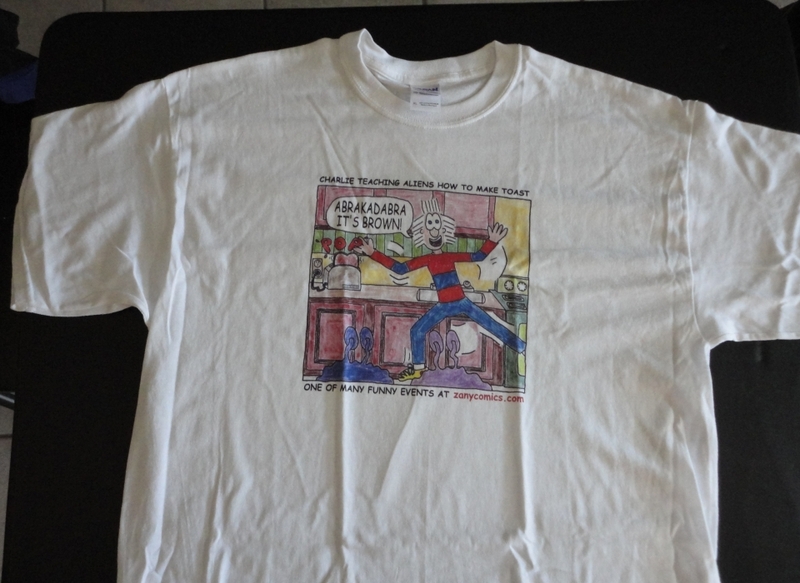 I liked the large panel in this comic so much that, I even made it a T-shirt. Click on image view for larger view. One Zany World is getting closer. It starts the first Monday in September! Captain Charlie is an amazing magician! The best thing since sliced bread. ha, ha, and you can’t beat sliced bread! You thought I was kidding…but seriously, you can’t stop binky. Binky cannot be stopped. The shirt is cool. I actually do wear it from time to time. hey, you should see if any of your readers might be interested in purchasing a shirt! No, I can’t be stopped! Though I can be delayed with chocolate. I think the big panel looks nice too! Thanks, It was done in old fashion pencil, ink, and colored pencils on bristol.